Second on my Mummies of the World exhibition list are the mummies of Nes-Hor and Nes-Min*. In life, Nes-Min and Nes-Hor were priests of the Temple of Min in the ancient city of Khent-Min. 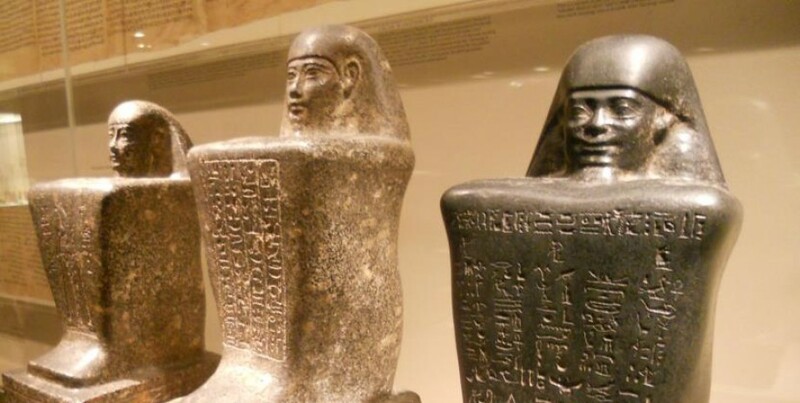 Although they lived during different periods in ancient history (Nes-Min lived during the Late period, while Nes-Hor lived 200 years later in the Ptolemaic period), both were stolist priests and were responsible for caring after the temple’s many statues of the gods. Their sarcophagi were constructed from wood and painted with elaborate images and hieroglyphs indicating their names and occupations, as well as prayers to help guide their souls to the afterlife. *Wondering why both priests have ‘Nes’ at the beginning of their names? In ancient Egyptian, ‘Nes’ means ‘he belongs to’, indicating the individual is a priest or some form of servant. Last but not least, I can’t help but share one of the most interesting sets of mummies in this fabulous exhibition. Meet the Orlovits family, a trio who belong to a group of 18th century mummies discovered in a crypt in Vac, Hungary in 1994. The Orlovits, along with over 250 other residents of Vac, were mummified—not on purpose during any post mortem procedure performed by other humans—but by a natural process involving the cool, dry air in their crypt and oil from the pine boards that were used to create their coffins. Michael and Veronica Orlovits and their son, Johannes, are particularly important due to the discovery of tuberculosis on the bones of the mummies. By taking tissue samples from the Orlovits family, scientists can study the tuberculosis infection, provide an idea of how drug-resistant strains develop, and work toward combatting such strains in the short term. 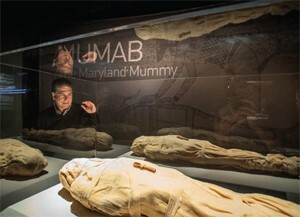 Overall, I thought that the Mummies of the World exhibition was well laid-out, informative, and successfully exhibited both objects and information in a manner very appropriate for its audience: A city of curious residents who are eager to get a more global perspective, and see exotic and interesting objects. While the case labels for the mummies and their accompanying artifacts, as well as the educational information provided, are not typical of a museum in language or vocabulary, they succeed in contributing to an exciting and informative exhibit for all visitors of every age. Mummies of the World is at the Cincinnati Museum Center until April 26, 2015. Great as usual Melissa, keep the information coming. Wow, how interesting, I wish I could see this exhibit. Melissa, you keep this blog interesting as well as full of info. Just as I am thinking….I wonder why….you answer the question I was formulating in my brain. Get talent before our eyes!